Packed with loads of wholesome soy goodness, the Original variant is the perfect choice for consumers who prefer a pure, simple and wholesome soya taste. Alternatively, HOMESOY Instant Breakfast Soya Milk with Oats gives you a velvety-smooth mouth-feel that perfectly balances with the authentic aroma of Oats. 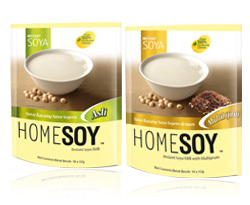 HOMESOY Instant Breakfast Soya Milk, warms you up to a great day!